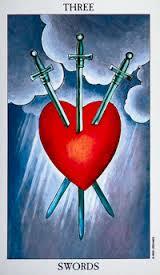 Three of Swords suggests heartache – loss – hurt feelings – loneliness. The stressful situation of the Two has developed and now there is no getting away from pain and suffering. Hiding behind a blindfold, refusing to take sides or make a decision is no longer effective in shielding you from an unpleasant situation. The swords indicate having to forgive someone, ask for forgiveness of another or even forgive yourself. As we know, The Suit of Swords deal with communication, so one of the messages in this card is to talk about your pain or loss and not keep it bottled up inside. A problem shared is a problem halved. When we keep things to ourselves our perception becomes very narrow. We can become fixed in our opinion and views waste years nursing our pain. We may have it all wrong. Seeking the help of a counsellor or just a good friend can throw light on the dark areas of our mind and soul. It can help us see things in a different light and the unnecessary damage we are doing to ourselves. The Three of Swords advises you to open up and let it go. even the loss of a legal case. The Three of Swords can represent the legal battle in a separation or divorce; the Family Courts or Legal System and a custody battle. Can be a stressful place to be when this card appears. You might feel that you have to watch your back at work as colleagues put you down. Gossips and betrayal at work can unfold on a job loss. The Three of Swords in a career reading can also suggest working in a cardiac unit, surgery, grief-counselling, mediation and even acupuncture. Heartbreak, Tears, Deep Sadness, Trauma, Emotional Release, Love Triangle, Deep Issues, Communication Breakdown, Arguments, Angry Words, Surgery.